This is it! This is what I’ve been waiting for in Hindi cinema. Finally, a film that resembles the Bollywood masala movies I love from yesteryear. Sure it lacks a few songs and the story isn’t all it could be, but the action is right back where the angry young man started in a fun film that delivers plenty of masala goodness. The story revolves around Vijju, a retired hit man who has come back from Paris ostensibly for one last job. The contract is to kill ACP Karan (Sonu Sood) who has vowed to eliminate the gangsters in his area of Mumbai. This has severely put a crimp in the daily dealings of Kabir Bhai (Prakash Raj) who is determined to eliminate Karan before Karan eliminates him. Added in is a romance between Karan and his old school friend Tanya, whose best friend Amrita just happens to be the daughter of one of Vijju’s old flames. We also get Hema Malini as Vijju’s estranged wife and a great performance from Subbaraju as one of Kabir Bhai’s henchmen. 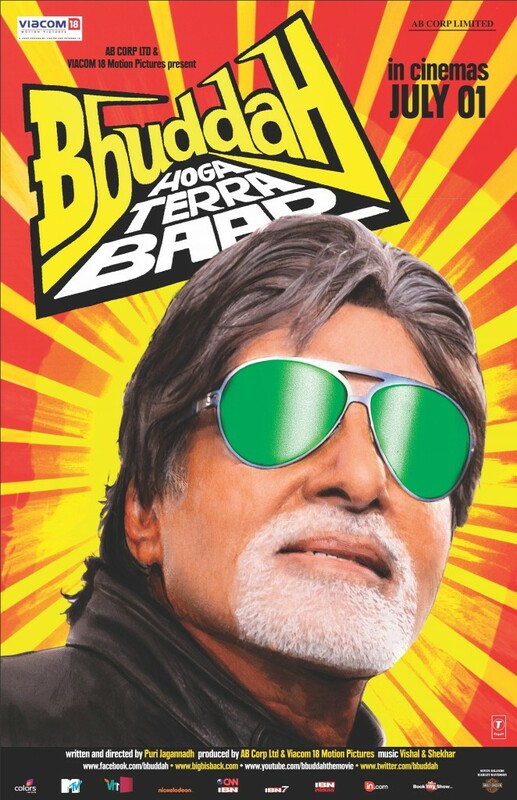 Bbuddah Hoga Terra Baap is a tribute to Amitabh, by Amitabh. He is very much the hero, complete with swaggering walk and hero dismount from a motorbike. The only thing missing is the patented Southern Style Hero Run, and we can cut him a bit of slack on that. There are some great fight scenes, and while Amitabh does look a little stiff, Vijay has done a good job in making the fight sequences look credible. 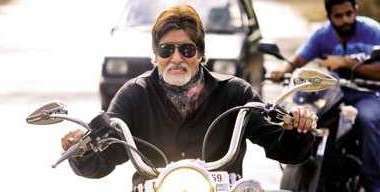 The ‘angry young man’ attitude is there in spades and the whole film hinges on Amitabh’s ability to command our attention. This he does with ease, even when sharing the screen with Sonu Sood in a very tight police uniform! And it’s not just because of his stylish scarves, nifty jackets and very cool specs and shades (although I must admit these don’t really say Paris to me – much more Hyderabad filmi style), Amitabh still has the commanding presence that made him a star in the seventies. These are my favourite of his many pairs of glasses – very cool! 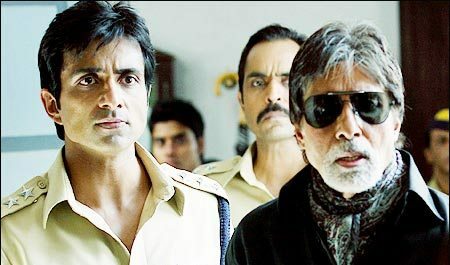 Sonu Sood is more understated than usual in his role as the police officer, but he comes into his own in the action scenes and when he is interrogating his prisoners. I really do prefer him in negative roles and every time he slips into a more ‘bad’ persona he is much better. His romance with Tanya isn’t very convincing at all, although this may be because Sonal Chauhan is very wooden in her role. She does improve in the second half, but by that stage it’s really too late for me to have any interest in her character. Charmy though is excellent as Amrita and has some great comedy. She makes the most of her role and is impressive in her scenes with Amitabh. Another very good performance from Charmy, and I really hope we get to see her in some meatier heroine roles as she is such a good actress. Although Hema Malini only has a small role in the film she makes an impact and is as good as ever. It would have been nice to have a little more of her Sita Malhotra and a little less of Kamini and her histrionics but you can’t have everything. Perhaps now that Prakash Raj seems to have a contract to appear in every single Telugu and Tamil film made, he’s now reaching out to include Bollywood in that list – this can only be a good thing. He is in fine form here as the chief gangster and brilliant in the final scenes. It’s also great to see Makarand Despande and his wild head of hair make another effective appearance as one of the gangsters. It’s not a totally great film though and there are some flaws. The pacing is uneven in the first half and there are times when the set-up begins to drag. Raveena Tandon overplays her role as Kamini and although there are some funny moments, it’s all too cringe-worthy to make her the femme fatale she tries to be. It’s a shame as it is great to see her back on screen again. There is also a lack of songs and very little dancing. However, the one song we do get is a fun remix of old Amitabh hits and features a cast of backpacker back-up dancers. Go Meera Go! Puri Jagannath is probably most well known for his brilliant film Pokiri with Mahesh Babu, but he has made many other hit Telugu films and his style of film making is very clear here. Given that I’m mainly watching Telugu and Tamil films these days I think that plays a large part in my enjoyment of Bbuddha Hoga Terra Baap. The fight scenes and the final shoot-out are also very southern in style but work well within the story and are very well done. The writing does include a number of references back to old Amitabh films but I although I recognised some of this I wasn’t always sure exactly which film it referenced. It does pull the focus of the film back to Amitabh and the film works best when considered as a tribute to his films of the seventies. One for Amitabh fans and anyone who enjoys their movies with more masala than logic. The angry young man is back – just make sure that you don’t call him old! Temple says: I don’t think this is anywhere close to being a great masala movie. It plays as a great tribute to Amitabh, and I did enjoy a lot of it on that level. But. If you aren’t familiar with the Big B in his heyday, I don’t know that a lot of the dialogues and visuals will work as well, or the one big musical number Go Meera Go which is a pallid remix of old hits. There is really no story for the first half, it is Amitabh reprising some of his best known moments. It’s all filmed beautifully, and with the flair and pace I expect from Puri Jagganadh, but there is a clear separation of the plot happening for supporting characters, and Viju being a showcase role with little connection. This changes in the second half when all of a sudden Viju has a past and an emotional life and it’s all supposed to be terribly sympathetic. By then it was too late to change Mr Bachchan into the aging hit man with family concerns so it fell flat for me. I also had flashbacks to the hideous emotional manipulation and melodrama of Baghban as soon as I saw Hema Malini. 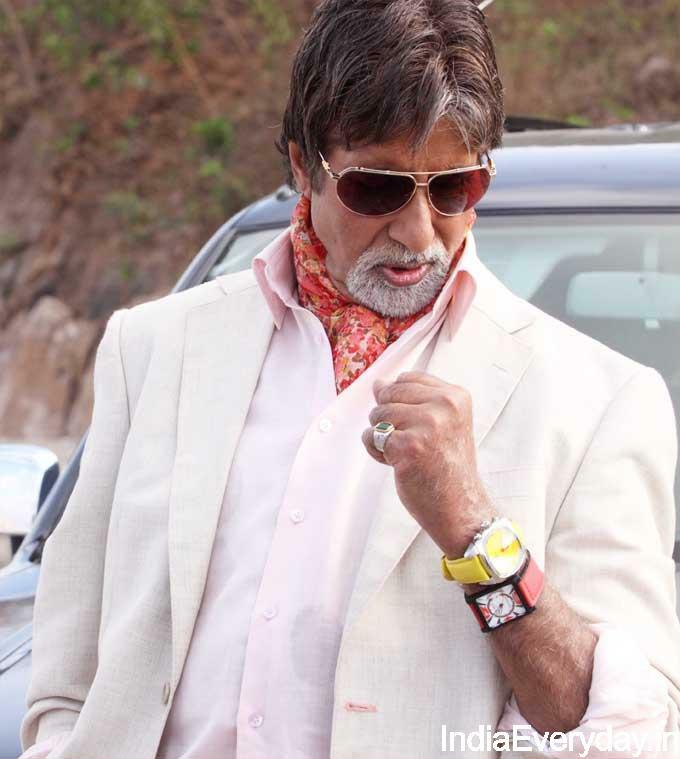 Occasionally Amitabh also seemed to be channelling sleazy Sam from Kabhi Alvida Na Kehna so that didn’t help either. I cannot imagine better casting (apart from the obvious) to play Son of the B than Sonu Sood. He plays it pretty straight but seemed a bit too uptight in some scenes. It may have been the very snug fit of his uniform that caused this effect! Raveena Tandon was terrible. Her orgasmic whimpering every time she spoke to or about Viju and hammy acting were among the few false notes in the supporting ensemble work. I cheered (all by myself, in a near silent cinema) for Prakash Raj and Subbaraju as I knew they ‘got’ the style and would add the level of commitment to badness I love in Telugu films. I didn’t like the girls’ roles at all, and I seem to have managed to almost forget them already. They were just fodder for (often sleazy) jokes, and made too many stupid decisions. I like Charmme but this role was a disappointment for me. See it just to see Amitabh Bachchan strut his stuff, even though he does get some hideous denim in which to strut. And he did a lovely job singing the beautifully simple and melodious Hal e Dil. I think the Go Meera Go song sums it all up for me though. Once I saw that I just wanted to go back to the originals, not the lightweight remake. This entry was posted in Bollywood and tagged A. Vijay, Amitabh Bachchan, Bbuddah Hoga Terra Baap, Charmi, Charmme, Charmy, Hema Malini, Makrand Deshpande, Prakash Raj, Puri Jagannadh, Raveena Tandon, Sonal Chauhan, Sonu Sood, Subbaraju. Bookmark the permalink.